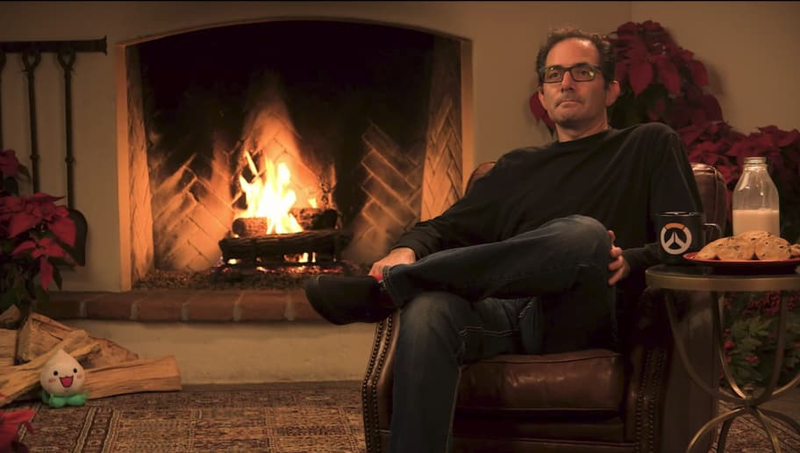 Just when you thought the holidays couldn't be any more exciting, on Christmas with no announcement or explanation, the official Overwatch Twitch channel began broadcasting an endlessly looped video of Overwatch Game Director Jeff Kaplan sitting in front of a festive fire. Thousands of people have been watching Jeff pensively stare into the distance while a fire crackles merrily behind him. Twitch chat seem to be equal parts delighted and confused, all the while arguing about whether or not this is indeed a looped video or Jeff Kaplan actually sitting silently in front of a camera for hours. Watching yule logs burn in a fireplace isn't a new holiday trend but it's certainly not something the Overwatch community was prepared for today. The amount of viewers has reached well over 30,000 while Jeff silently switches positions, casually stares into the camera, looks away passively, scratches his nose, and occasionally gets nudged by an off-screen microphone. The Overwatch team (and Blizzard in general) is known for their lighthearted quirkiness and Overwatch Yule Log Featuring Jeff Kaplan is obviously something fun and unique the Overwatch team came up with to entertain fans (and to troll them a bit too, let's be fair). We can only hope the stream is still running throughout the rest of the holidays because as we all can agree, Overwatch Yule Log Featuring Jeff Kaplan is an instant holiday classic and the Christmas tradition we never knew we needed.